As a proud American, maybe you are looking for a excellent house flag pole or want to make a gift to yourself, friends and loved. Displaying a flag on your home tells the world what's important to you. Unfortunately, have you felt the frustration of trying to keep your flag free from tangling around your flag pole? 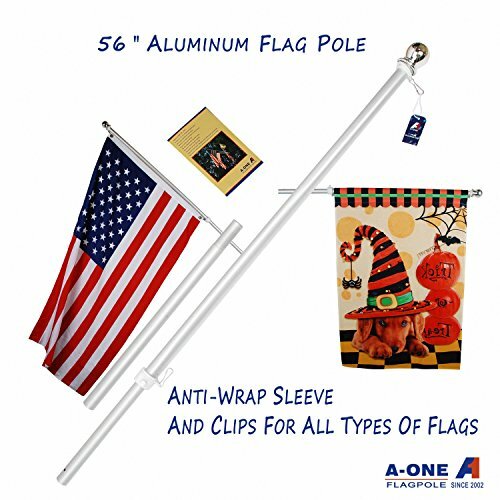 A-One USA house flag pole has stainless steel mount clip never rusted, won't make rust spots on your flag. Two anti-wrap clips are provided so your flag will fly tangle-free in windy conditions. This simple & solid pole is perfect for calling attention to your favorite flags. A-One Flag Pole wants you to be happy and stand behind our products. All A-One products come with the installation instructions, installation simple and easy to use, 1 year hassle free warranty. Package Included: Aluminum pole, Stainless steel clip and User guide. A-One is a professional flagpole maker with 15-year experience in the industry.Millions of our poles are erected all over the world since a decade and half ago. We offer flagpoles with excellent quality and serve a diverse range of products: The lengths vary from 20cm to 6m. Materials include plastic, fiberglass, steel, stainless steel, and aluminum. We maintain a strong design personnel to tailor products for our clients. Customer Service: Please read the user manual carefully, if you have any questions before or after purchase, feel free to contact our customer service email: a1flagpro@outlook.com. ANTI-WRAP TUBE: This heavy duty aluminum poles with anti-wrap sleeve to prevent tangling and keep the flag waving proudly. PERFECT MATCH THE HOUSE: Let your favorite flags fly high with the help of our wooden house and estate flag pole. MAKES AN EXCELLENT GIFT: This stunning house flags pole makes an excellent gift for every proud American. Display your favorite Valentines Day flag, Mother's Day, Easter, Thanksgiving, Christmas, etc. Gift one to yourself, your loved and friends ones today! SATISFACTION GUARANTEED: A-One flagpole wants you to be happy and stand behind our products. All A-One products come with the installation instructions, installation simple and easy to use, 1 year hassle free warranty. If you have any questions about this product by A-One, contact us by completing and submitting the form below. If you are looking for a specif part number, please include it with your message. casa pura Entrance Mat | Europe's # 1 Front Door Mat for Home and Business | Black - 36" x 60"
Beware of BOXER DOG on Duty Yard Patio House Banner Garden Flag w/ Iron Stake Flag & Garden Pole 10 1/2" x 16"